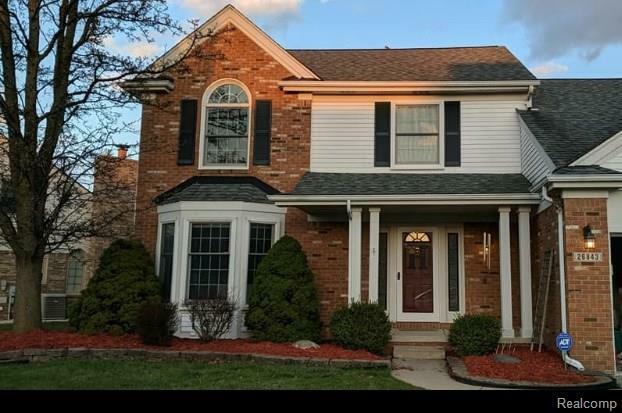 HIGHEST AND BEST OFFERS DUE MAY 4, 10;00 AM Outstanding 3 bedroom colonial in Woodhaven with fabulous 19x10 bonus room waiting for you to turn it into your hearts desire. Spacious eat in kitchen has nice oak cabinets and all appliances are staying! Lots of natural light in this home with Andersen windows and 2 large door walls, one in kitchen and the other in the family room. Please take note of the gorgeous natural brick fireplace. Upstairs is the nicely done master suite with tiled shower and walk in closet. Two toher bedrooms are spacious with large closets. Basement is equipped with a 108 inch projection screen and sound system that can remain with the right offer. All of this and a laundry room on the main floor and paved patio out back to enjoy backyard bbq’s. Conveniently close to elementary school, stores, restaurants and highways. Gibraltar school district. Certificate of occupancy will be provided by the seller!! Call to see this wonderful home today!